ELVES has just launched its new Facebook page - ELVESIreland. Keep up to date with ELVES by following our page. New ELVES Signage was recently unveiled at the Mondello Park International Race Circuit in Kildare. The new signage is the first time the ELVES brand has been seen in a public place and is the start of a wide range of activities to promote ELVES and responsible End-of-Life Vehicle recycling. 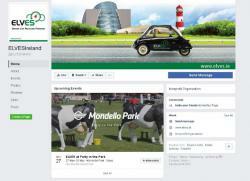 ELVES plans to be out and about in the summer at events like Mondello Park raising awareness about car recycling and the right way to do it. So what is ELVES and what does it plan to do? ELVES is the collective compliance scheme for End-of-Life Vehicles (ELVs). It has been set up by vehicle manufacturers to improve the recycling of scrap vehicles and help ensure Ireland meets the reuse, recycling, and recovery targets for ELVs. We are delighted to be able to announce that ELVES (ELV Environmental Services CLG) has been approved by the Minister for Communications, Climate Action and Environment, Denis Naughten, to be the collective compliance scheme for vehicle importers under the End-of-Life Vehicle Regulations.